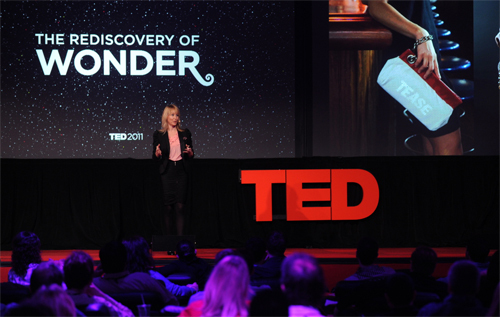 In February, I shared my passion for the integration of fashion and technology with the TED audience at the TEDYou Stage in Palm Springs. During my talk I wore a light up jacket that was made from hacking Eric's HeartSpark necklace. 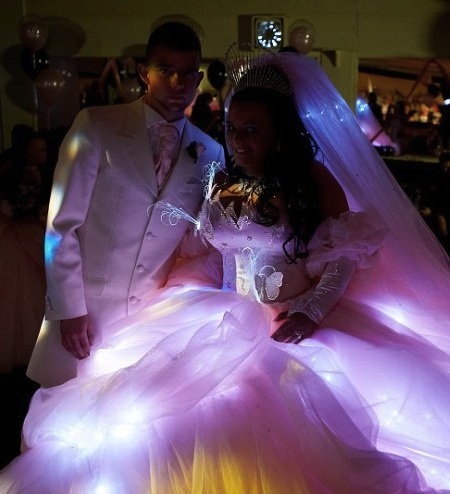 The jacket was beaded with lights that blinked in rhythm with my heartrate in real time. LadyAda Makes Wired Magazine. What took so long? I walked by the news stand this morning and saw a familiar face. Ms. Limor Fried was there looking back at me with a strong and powerful glance on the cover of Wired Magazine. 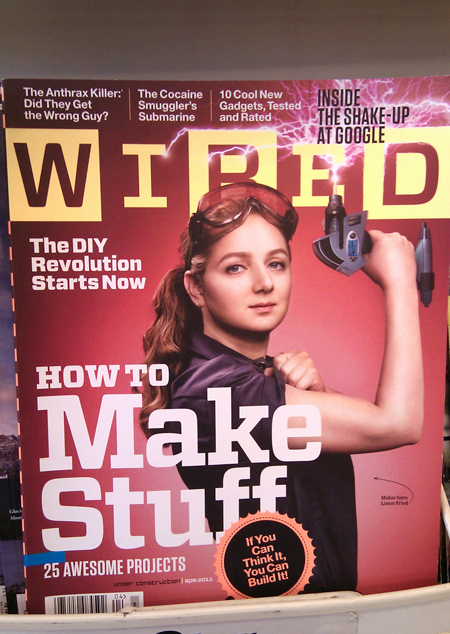 Amazingly, according to Evil Mad Scientist Laboratories, this is the first time a female engineer has been featured on the cover. 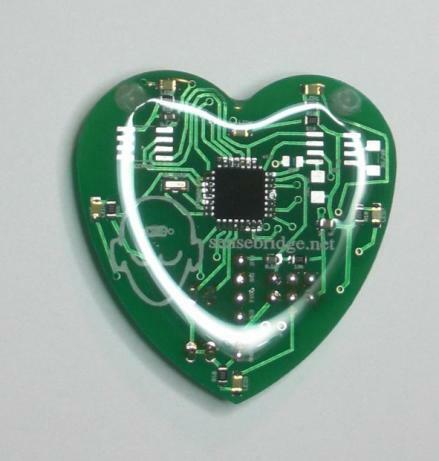 What will happen with intellectual property laws when we have mass-produced fashion with integrated electronics? Should we follow the fashion industry or the science industry when it comes to IP protection? 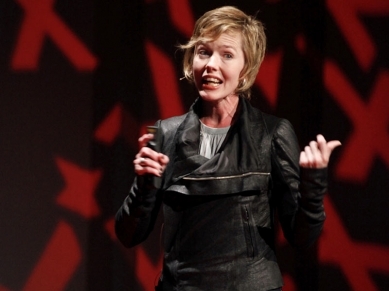 In case you need some help deciding, here is Johanna Blakley from readytoshare.org talking about "Lessons from fashion's free culture" from TED.COM. Just in case you missed it, watch the amazing light up clothing from the Super Bowl Half Time Show. Future Fashion Hack Workshop at eTech Ohio! Think Project Runway is hard? Try hacking your clothes with technology in 6 hours! On February 1st, watch live as I challenge 14 fashion students from the Fort Hayes Metropolitan Education Center to hack their clothes with technology at eTech Ohio. With only 6 hours and no prior knowledge of technology, Juniors and Seniors will instruct and learn how to infuse technology such as conductive thread, fabric, fiber optics, wires, and sewable LEDs into garments. The designs will be showcased on the catwalk prior to the keynote event on the 2nd. Don't Miss it! According to Chinese Astrology, 2010 is the year of the Tiger, but I am calling it the year of the Tigress. It is a year of personal growth, intense change, travel, opportunities, friendship, and challenges. Every day, I had to learn how to land on my feet. The year got off to a grand start with another episode of the show, MyHome 2.0. I created an interactive Skype Wall for the Reyes Family in Tampa, Florida and shared the stage with the flawless Tiffany Smith and Mark Montano. The Reyes’ loved the Skype wall I built and have called me from it a few times after the show. They still use it weekly to keep up with friends and family. Directly after MyHome2.0, I flew to LA to spend a day with my friend and visit Disney Imagineering. I can't say what I saw, but it was stupendous! It was a dream visit. While there I had dinner with one of my favorite fashion techie’s Ms Syuzi Pakhchyan of Fashiontingtech.com.